When people think of First Lego Leagues it usually conjures images of kids with piles of Legos and electronics working to build the better machine. The real-world application of those projects isn’t so much what the kids are actually building, but what they’re learning in the process. The First Lego League Global Innovation Challenge gives kids the chance to build something that might actually change the world. 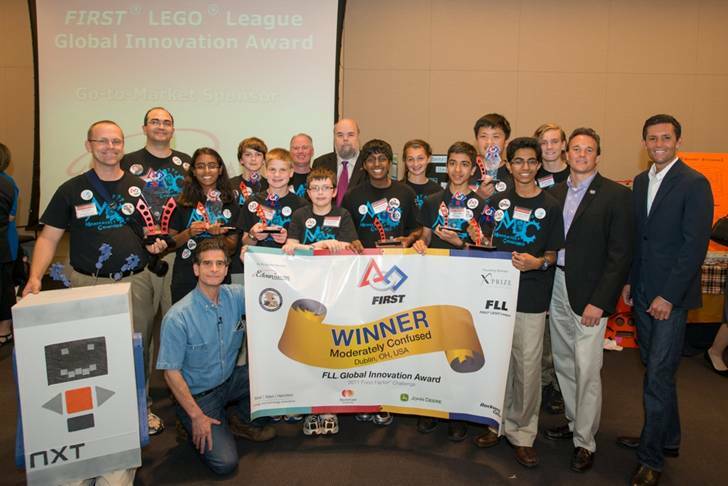 Last Fall, First Lego League teams of kids ages 9-16 were challenged to research the problem of food contamination and develop solutions that would make food safer. Teams from over 60 countries then submitted their ideas which received nearly a million votes that narrowed it down to just four finalists. Smart Sticker by S.I.S. Robotic Revolution from Shelton, Conn.
From these four teams a panel of judges had the task of selecting one winner to receive a $250,000 investment in services from Edison Nation to help bring their idea to market. Runners-up received cash prizes from the X Prize Foundation. It turns out that this was too difficult a task as the judges chose two first place winners, Moderately Confused and S.I.S. Robotic Revolution, and awarded each the $250,000 prize! Check out the videos from the four finalists below and watch them with your kids. Maybe you’ll help inspire them to invent what could be the next big thing that changes the world for the better!